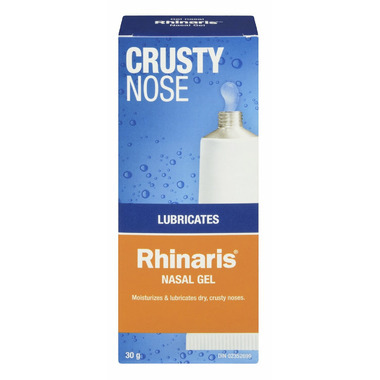 Rhinaris Nasal Gel helps moisturize and lubricate dry nasal passages caused by low humidity in homes, office buildings, hotels and airplanes. It rovides long-lasting relief. Directions: Adults: Apply a small amount of gel into each nostril every four (4) hours or as needed. Protect from freezing. Medicinal Ingredients: Mixture of polyethylene glycol 15% and propylene glycol 20% in a gel adjusted to pH 5.5. Non-Medicinal Ingredients: Purified Water, Carbomer 934P, Sodium Carboxymethylcellulose, Sodium Hydroxide, Sodium Chloride, Potassium Chloride, Benzalkonium Chloride. Precautions: For nasal use only. Keep out of reach of children. This over-the-counter product was prescribed by my Otolaryngologist due to my sudden bleed; as a result, no more nose bleed and dryness. Does a great job keeping the nasal passageway lubricated. I've tried using vaporizers with no success, this product has helped me get a good nights sleep. I highly recommend it. Great product - really helps with a dry nose. Great stuff to use inside nose when it gets dry and sore - especially in winter. Great product. I suffer from nosebleeds due to dry air and low humidity and I this product never fails to disappoint! I find this gel lubricates a dry, crusty nose in a couple of minutes - it works for me! I'm very satisfied. I purchased this produce as an alternative to the petroleum based product I have been using for 20 years. The product is described as "a formulation of organic compounds:" hence the appeal. The product was full of inorganic products. The use of the term organic was misleading to consumers. The consistency was too liquid to be effective. it does not lubricate for any lengthy period. I would not purchase this product again.